Shenzhen Goodwill Technology Company Limited started in 2011, and is dedicated in manufacturing, designing, and marketing various car accessories such as car fan, car vacuum, car batteries and charger, mobile phone holders, beauty and grooming products, video gaming related items, etc. They have a reputation for selling high-quality products and you can get their beard trimmer from any shopping site or markets. Their covers over 15,000 sqm in China and has over 300 staffs. You will find plenty of products from them in Amazon and most of them are grooming or beauty products. You can also get a trimmer for your pet from them. The manufacturers of Sminiker products export to North America, Asia, the Middle East, Africa and Europe. Here is a review of their 5 in 1 waterproof beard trimmer. As you can tell from the name, it is waterproof. If that is what you need, wait no more but grab this product. It has a sleek and stylish outlook. You can use it for daily purpose because it is lightweight. Trimming your beard for a long time will not become a chore. You can use this comfortably. It narrows down at the bottom so that you can hold it firmly. It is black in color where the top part is silver and glossy. The power button is silver as well. There is a LED display light in the bottom, just above the charging point. 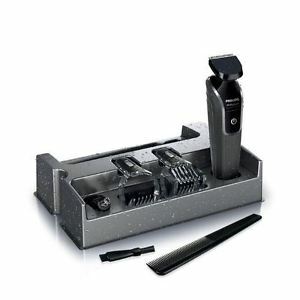 It comes with a nose trimmer, beard and mustache comb, precision trimmer and full-size one. You will also get a hair comb. At such a reasonable price, you will also get a base to store everything so you do not end up losing any of the attachments. The blades are super sharp. There will be no pulling of hair. To avoid any trouble, read the manual before usage. Since it is waterproof, you maintaining it and taking care of it is a simple task. If you wash the combs and blades after every use, you can make the device last for a long time. You can use the cleaning brush to keep it in first-class condition. You can use the blade for a zero-trim length. You will not find lubricating oil or a tube in the box because of shipping problems. Before usage read the manual and leave it to charge through the night. You can use it in the morning. The LED light will glow if you plug it in. It can be used anywhere on a global scale. There is a warranty of six months so you do not have to worry about buying it. If you do not like it, you can always contact the seller. The company know that they have put high-quality mechanisms and elements to make this product for you. That is why they provide six months’ warranty. The device is durable and lightweight. This entry was posted in Sminiker on December 18, 2017 by Professional Beard Trimmer Reviewer.